While you may sip a cup of coffee every single day, do you know where coffee is grown? A coffee plant flourishes in rich soil and milk temperatures; it also requires a lot of sun as well as rain. 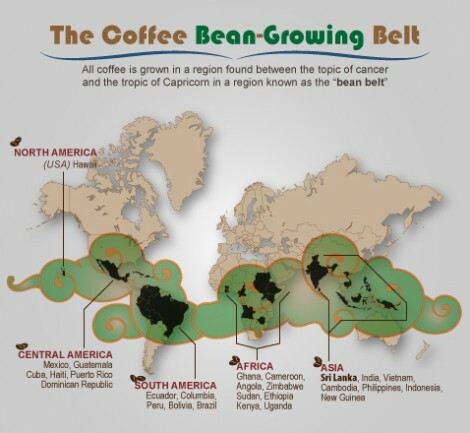 Naturally therefore coffee plants are grown around the middle of the world, commonly known as the Bean Belt. This area is between the tropics of Cancer and Capricorn and is illustrated in the info graphic below. In terms of finer details, a coffee plant requires steady temperatures of around 20 C and rich soil. There are two main coffee trees that yield coffee and of these two, the Arabica definitely scores as the better bean. The harsher bean is known as Robusta. The top ten countries that yield coffee are Brazil, Columbia, Indonesia, Vietnam, Mexico, Ethiopia, India, Geutamala, Cote d’Ivore and Uganda. Coffee took root in the mid 18th Century in Brazil and quickly thrived as well as spread around the country. Today, Arabica yields over a third of all coffee production around the world and is known to be of the greatest quality available on the market.